If you’re looking to vacation like a midcentury family, there’s plenty to do in the area. You can tour an old mine underground or the various locations in Bisbee that have seen ghostly activity. You can enjoy a glass of wine at the local winery, or go hiking and fishing in the nearby wildlife area. 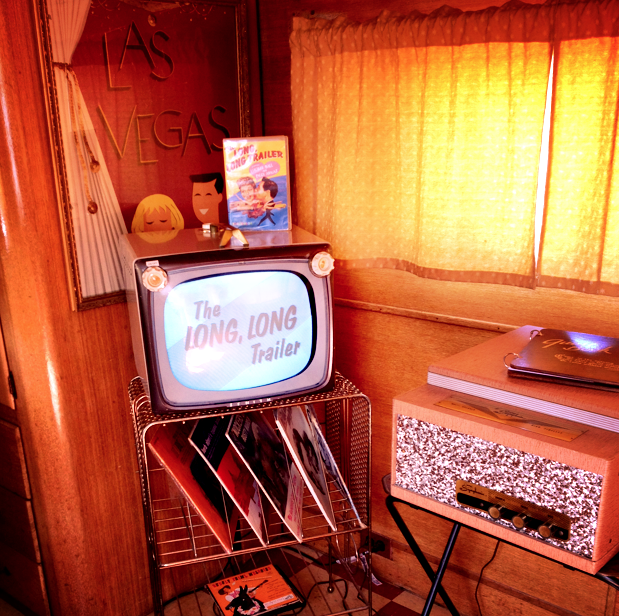 This 1957 Airfloat trailer has an MCM Las Vegas theme, complete with a vintage phonograph player. The Airfloat accomodates 2 people, but is one of the larger trailers in Shady Dell, as it was the “flagship” of Airfloat when it was produced in ’57. The tiki bus is a restored 1947 Airporter bus. It accomodates three people, and even has an outrigger bar outside. 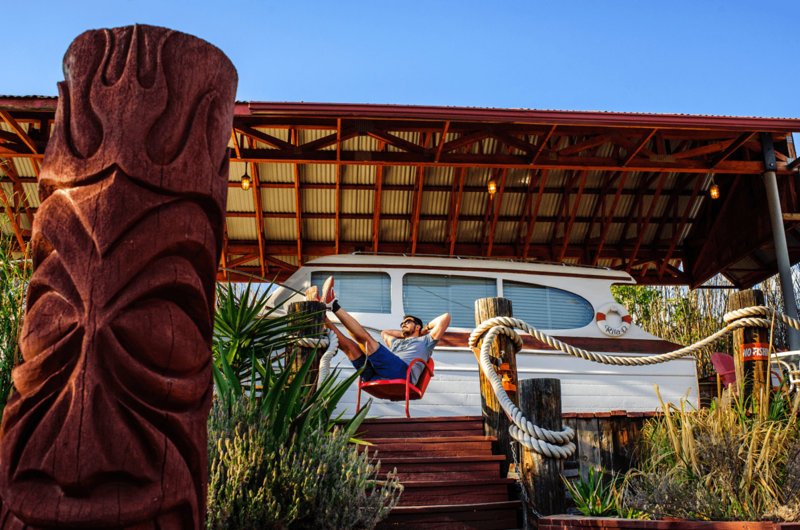 Shady Dell is home to 10 different places to stay, including trailers, buses and even a boat. The spaces are all vintage restored, and range from 1947–1959. 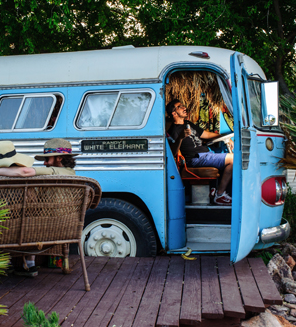 Most sleep 1–2 people, with the exception of the 1947 Tiki bus, which can fit 3 people. 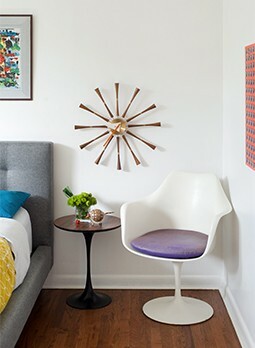 The interiors all stay true to their MCM roots, and many have vintage memorabilia and decor as well. Some of the spaces have themed interiors, such as the 1947 Tiki bus, the 1955 Airstream with its Southwest vintage decor, and the 1957 Airfloat, with a Las Vegas interior. To see more of the interiors, check out this video. The Chris Craft yacht is a pleasure boat that has been restored and furbished with vintage boating decor. It sleeps up to 2 people in the v-berth. 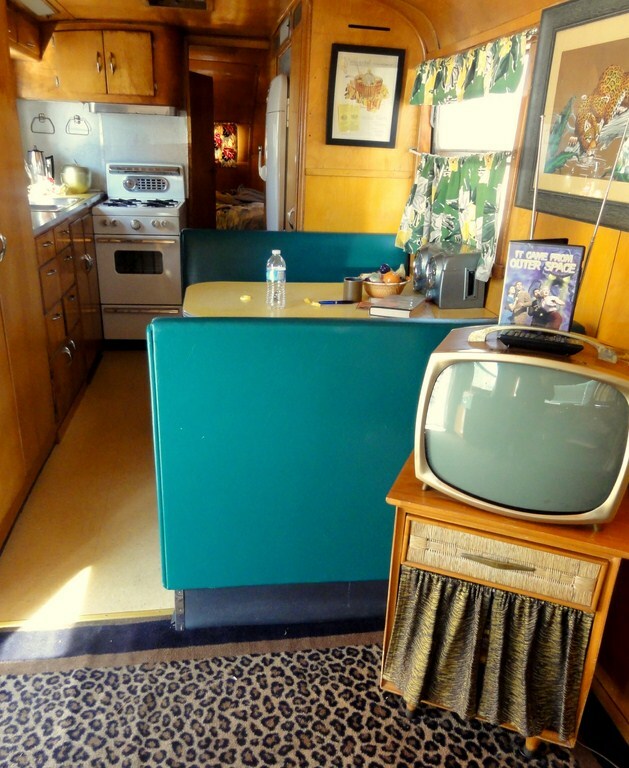 The 1951 Royal Mansion is a 33′ trailer with a full-sized bed, bathroom, kitchen nook and kitchen. It even has a vintage tube TV! Photo courtesy of otrwjam.wordpress.com. Even though Arizona is known for its deserts, Bisbee does experience some cold during the winter, though snow is more rare. The average temperatures in January–March range between lows of 35° F and highs of 55–60° F. If you’re looking to escape the winter weather, check out some of our other snowbird Atomic Getaways, but if you don’t mind mildly wintery weather, Shady Dell might be just the ticket.